I was flipping through the Summer issue of Disney’s Family Fun magazine and came across their Pebble Plaque activity. 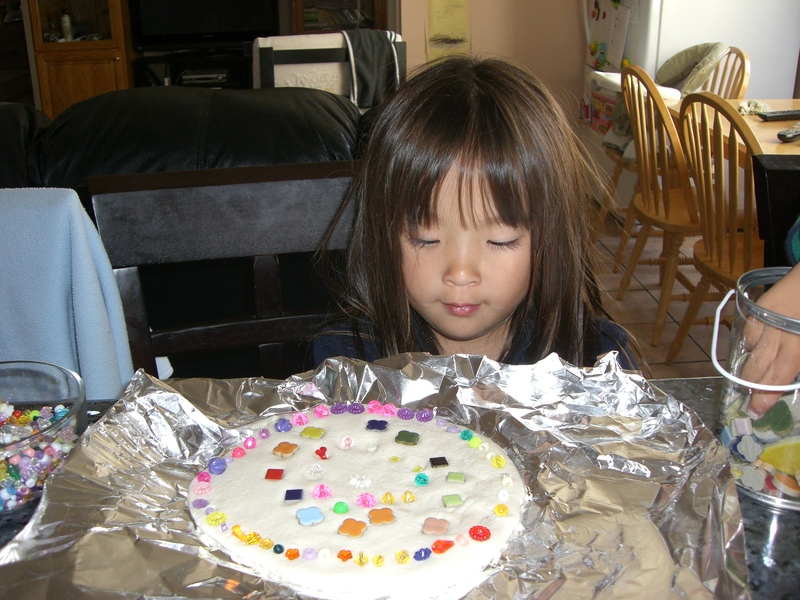 It was a little too elaborate for my 5 and 2 yr old but I loved the idea of the kids making a decorative “stone”. 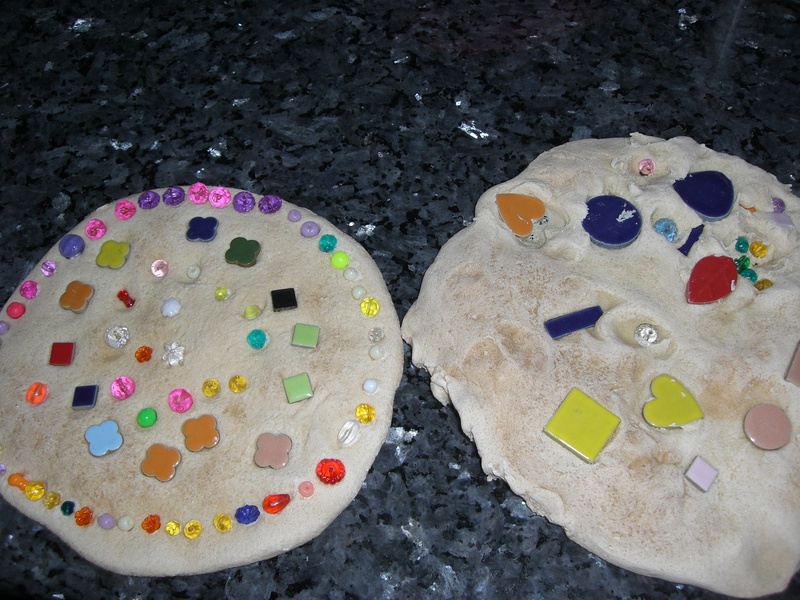 There are a bunch of different salt dough recipes but I basically followed the recipe from the Family Fun magazine but I halved it. Mix 1.5 cups flour, 1/2 cup salt and about 3/4 cup of water (I eyeballed the water to make sure it wasn’t too watery or to crumbly). Knead it until smooth, divide it in half and then roll them out into circles. I made one for each of my kids. Then I left the kids go at it decorating. 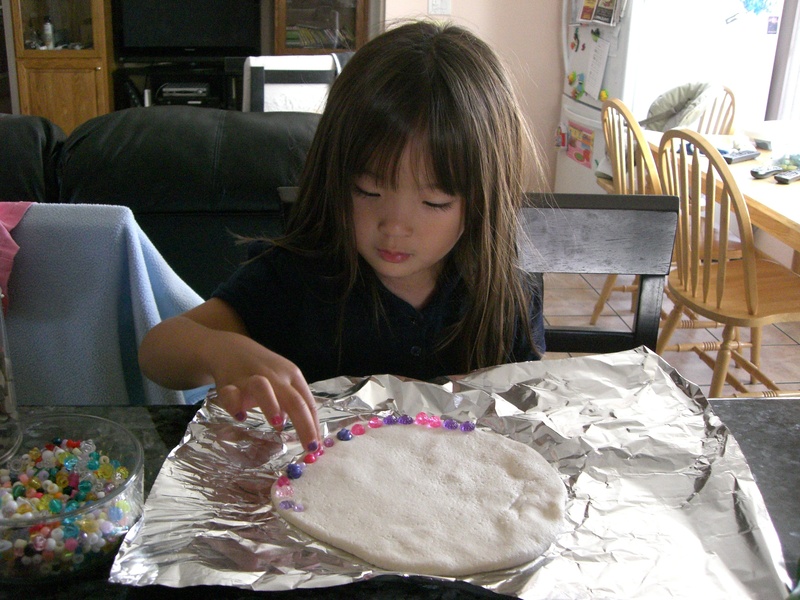 We had some beads and ceramic tiles to use. I wasn’t sure if the beads would melt or not but they made it through pretty well. My 2 yr old did have a hard time grasping the concept of not squishing the tiles in so deep but he had a great time making his stone. My daughter got quite elaborate with hers. Once the kids were done we baked them at 275 degrees for about 2 hours. I should have let them bake for longer because once they cooled and I lifted them off the foil I realized the bottom wasn’t as dry as I would have liked. 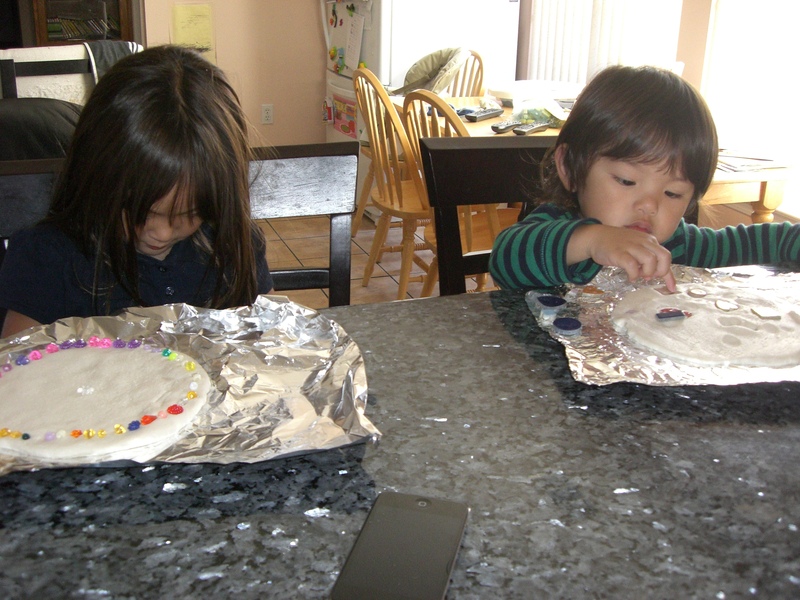 The beads survived but some needed to be glued down because they were loose but overall the kids loved them. It’s not quite that time of year yet and my daughter asks me every time we go into Target why are the Halloween decorations up already but she still picked this book off her shelf for reading time. It gets pulled out each year and it never gets old. A group of children are getting dressed up in their costumes and head out to find the witch’s house. Along the way they encounter a shirking, lurking Dracula, a ghastly ghost and a host of other frightening creatures. Will they make it to the witch’s house or will their fears get the best of them? 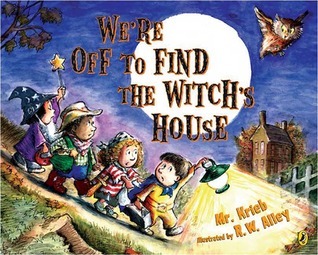 The book ends with the kids reaching the witch’s house where a party is going on and the kids are playing my daughter’s favorite party game, hit the pinata! The illustrations in this book are wonderful and we notice something new each time we read it like the first few times through I didn’t realize each child loses some part of their costume when they encounter one of the creatures. Then in the end the “creatures” turn out to be other children in costume and they show up at the party with all the lost items. This is the perfect book to get into the Halloween spirit with the little ones without it being too scary for them. 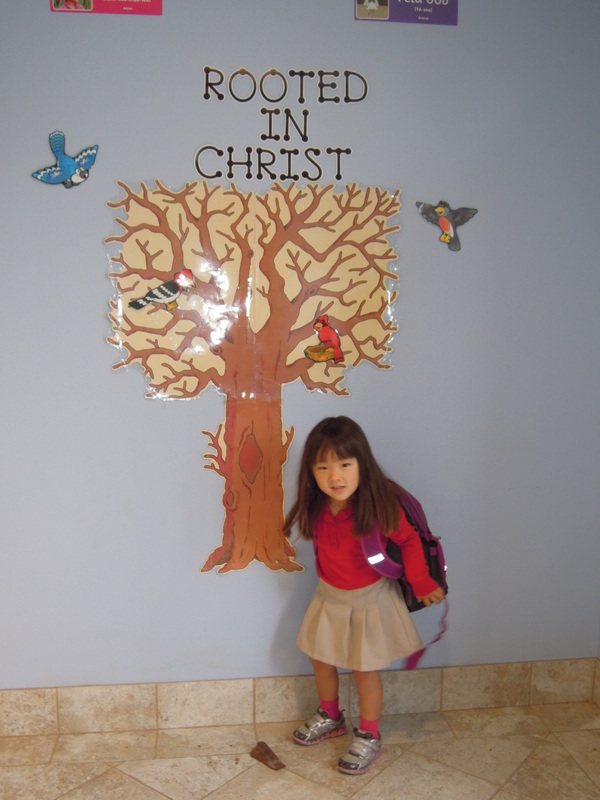 I can’t believe my daughter is now 5 years old and started kindergarten. Here she is on her first day. She is one of the tiniest in her class but other than some rough patches at drop off she’s doing wonderfully. Someone had mentioned how they do an “interview” with their child each year and compare how the answers change. This sounded like a fun idea and perfect for a school project they need to do putting together a book about themselves. If you haven’t done one I highly recommend it. You may be surprised by some of their answers. My favorite food is: chocolate! My favorite part of school is: P.E. First off I have to apologize for the picture quality. I didn’t have my camera handy so I used my phone. I came across this Showdown game on Pinterest which was pinned from Playdough to Plato’s blog. 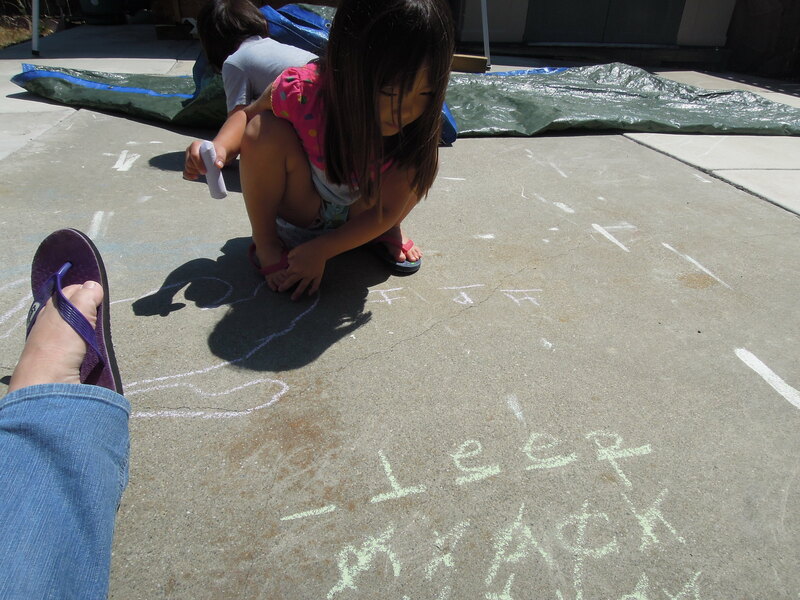 We actually did the activity back in June but I’m bad about getting photos off my phone. I wanted to make sure to mention this activity though because even now three months later my five year old still wants to play it. She’s been picking up her sight words really quickly since we’ve started making a game of it rather than straight studying. I made our two sets of the same sight words using two different color markers. 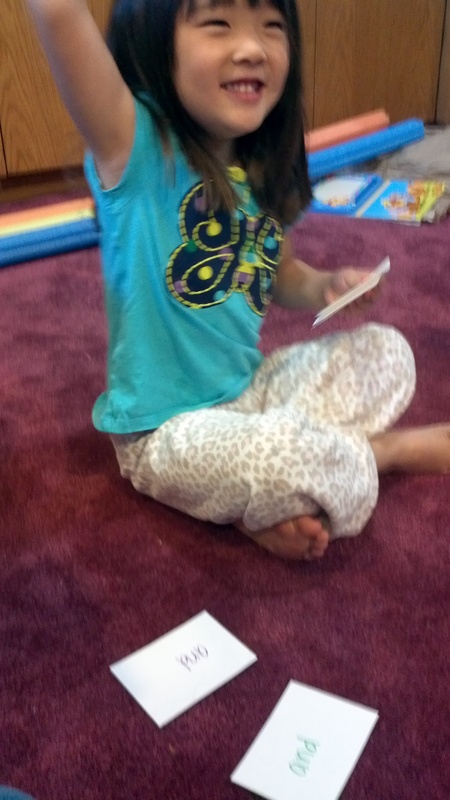 I picked out one card, told my daughter what it was and hid it against my chest (Playdough to Plato made a great suggestion to close your eyes to build anticipation and make it more fun for your child while they try to find the same word in their pile). Then once she found it she also hid her card until I counted to three and then we both slapped our cards down and checked to see if they matched. 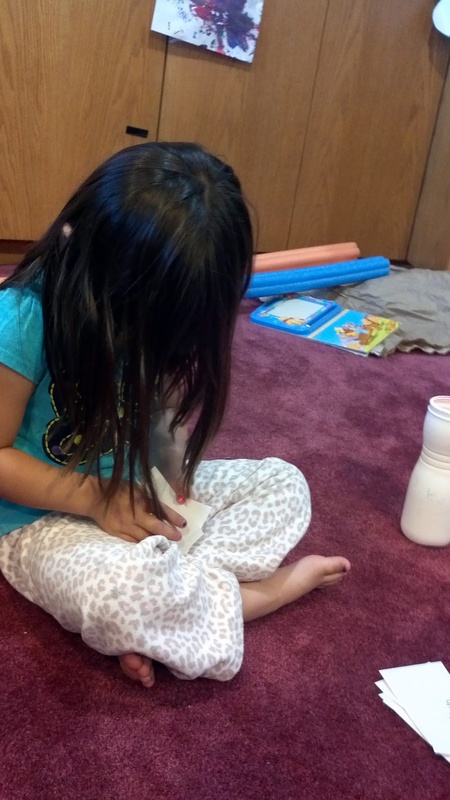 Once she learned a set of sight words I would just make a new set and kept going. 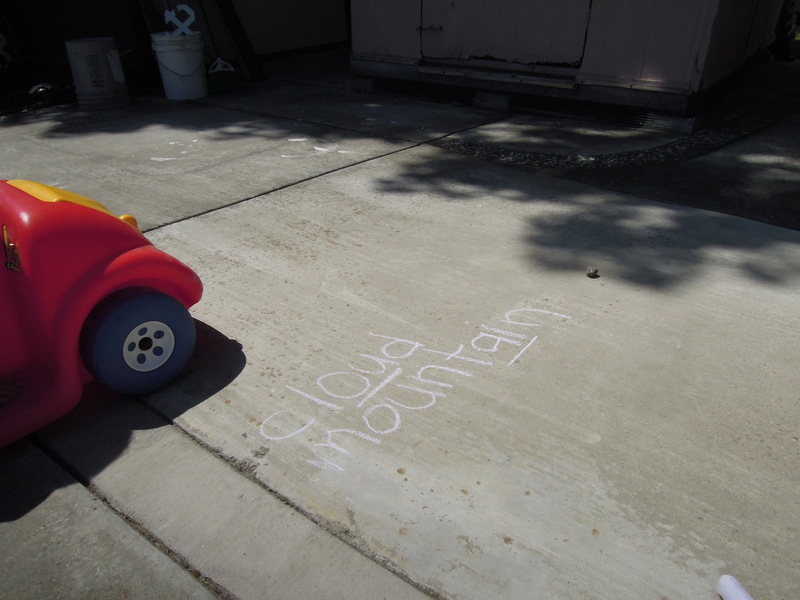 It’s a great way to make learning sight words fun. If you saw my post yesterday about the layered liquids experiment then you know I found it in a book we got recently. Well on the opposite page was the bobbing bouncing raisin (or as I’ve seen it called elsewhere the dancing raisin) experiment and just so happens we had a container of raisins handy. First we started off with this small spice container and 7-Up but not much luck. I figured we needed more soda and more fizz. Unfortunately our only bigger glass wasn’t totally clear but we still had fun watching what happened. I wasn’t sure what to really expect and dropping the raisins in was like dropping those alka-seltzer tablets into water. Instant fizz. And then the cool reaction started as the raisins which had sank to the bottom slowly started getting covered in bubbles and next thing you know they were rising to the top and then falling back down. 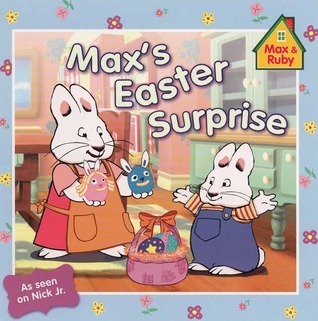 The book we were using explained how the bubbles stick onto the raisin so when they rise they take the raisin with them and as the bubbles pop at the top the raisin sinks again. 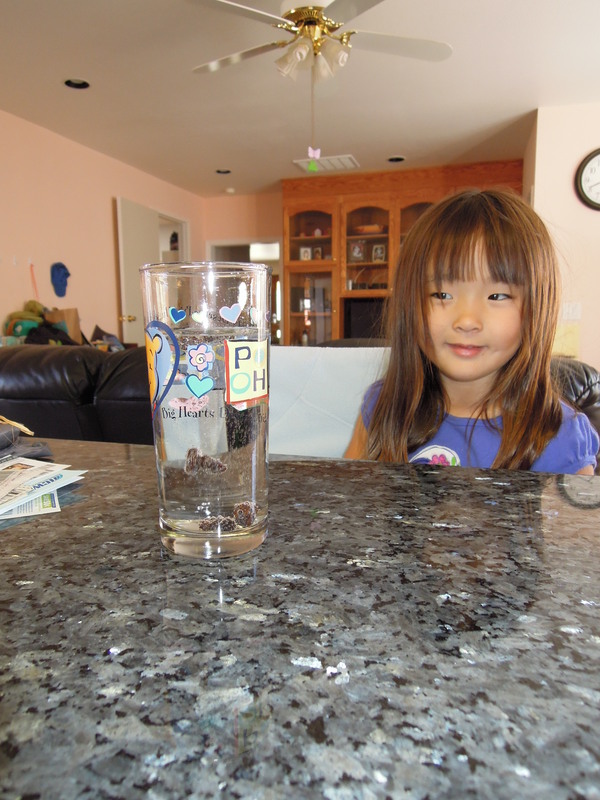 Soon the experiment turned into a game of whether or not my daughter could catch the raisin before it sank back down. 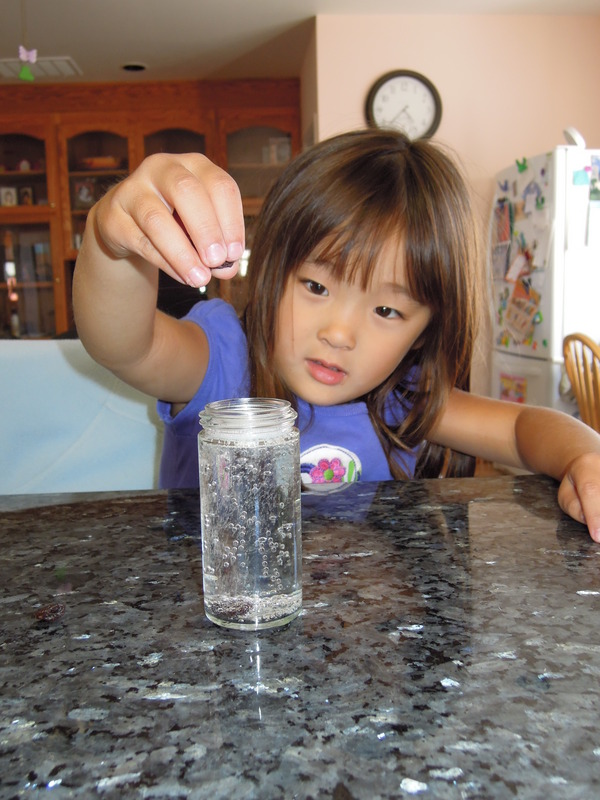 It was surprisingly hard to do it since as she stuck her fingers in the bubbles would pop and the raisins sank like a rock. 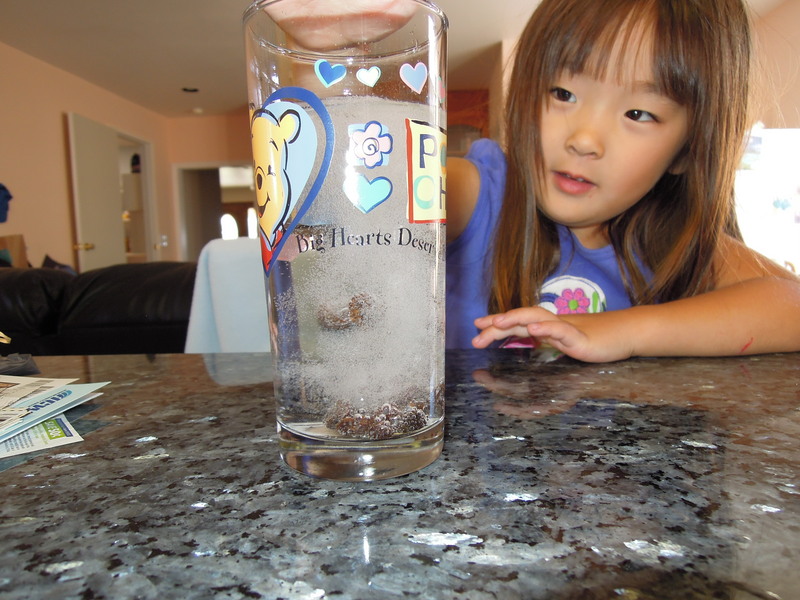 That kept my daughter amused for awhile until the soda started to lose its carbonation. This is the book we used and you can purchase it through my store if interested. Have I mentioned how much I love being an Usborne Books & More consultant? One reason is that I get to try out some amazing books because I really don’t like to sell books I haven’t read and enjoy myself. 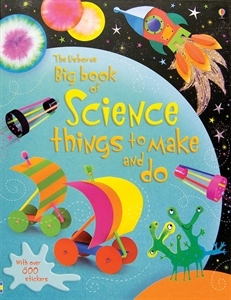 Today my soon to be 5 year old and I busted out our new book, Big book of Science things to make and do, for our afternoon activity. 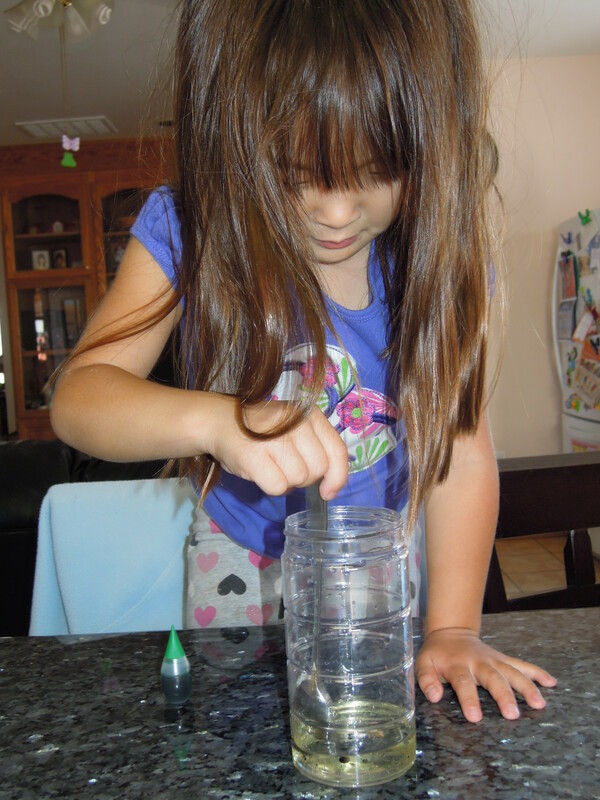 She picked out the Layered Liquids experiment. 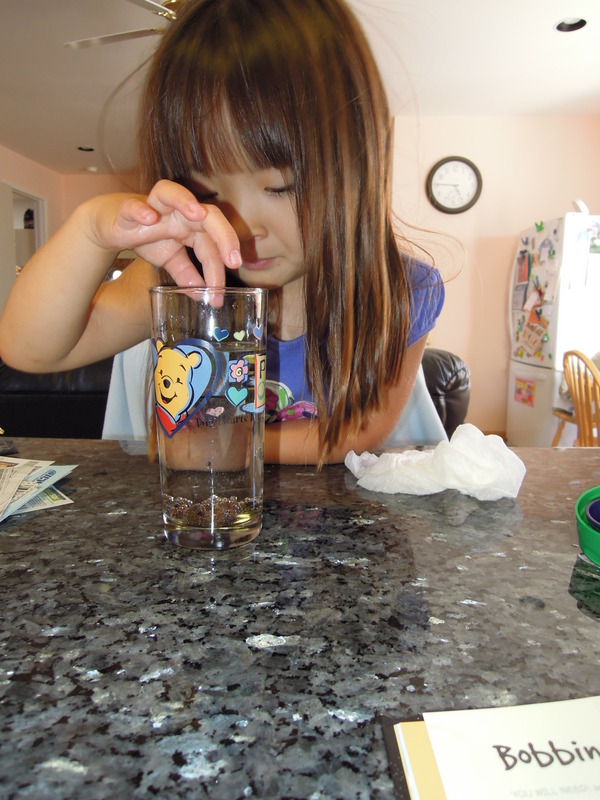 First we had a cup full of cold water and food coloring. 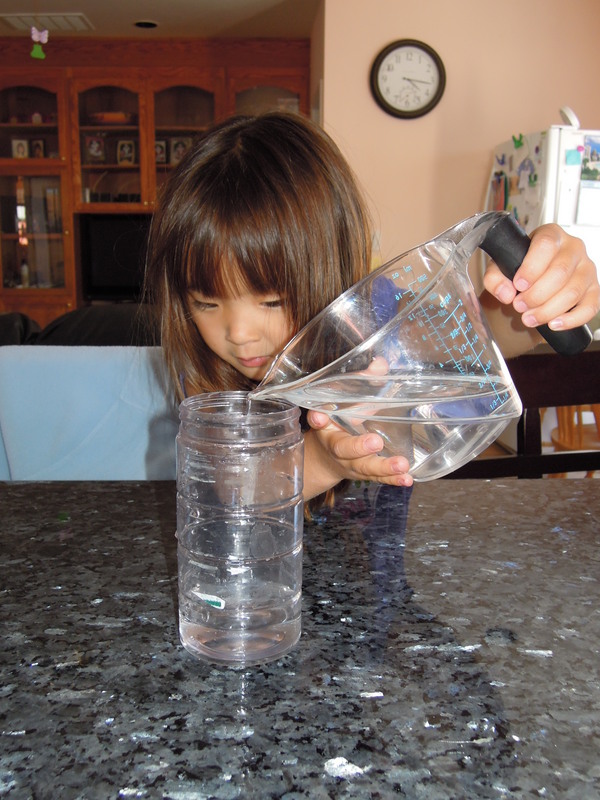 Note that I didn’t realize we should have been doing this in a separate cup and not the container we were going to be making layers in so after coloring the water we poured it back into the measuring cup. Next came the cooking oil. The directions just say to add 4 TBSP to the jar but I thought it would be fun for my daughter to see what would happen if you add food coloring. It was neat seeing how it stayed in a little blob like in a lava lamp instead of mixing with the oil. Even stirring wouldn’t get the food coloring to mix and I had her explain her observations about the difference in behavior of the food coloring in the water and oil. 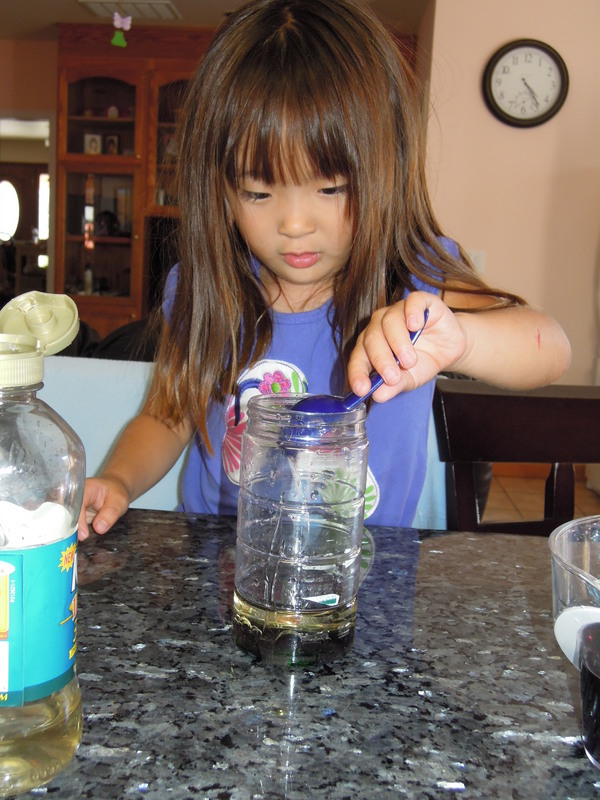 Then we slowly added the water to the jar (pouring it down the side of the jar) and watched as the water sank below the oil. How cool right? Thankfully since I’m rusty on all my science knowledge the book had a blurb explaining about the difference in density between oil and water caused the water to sink. I did have to simplify saying that the water was just heavier even though I know it’s not the most accurate description but oh well. You can’t really see it too well in the picture but it was also neat to see how the green food coloring we had put in the oil got sucked down into the water layer as well. 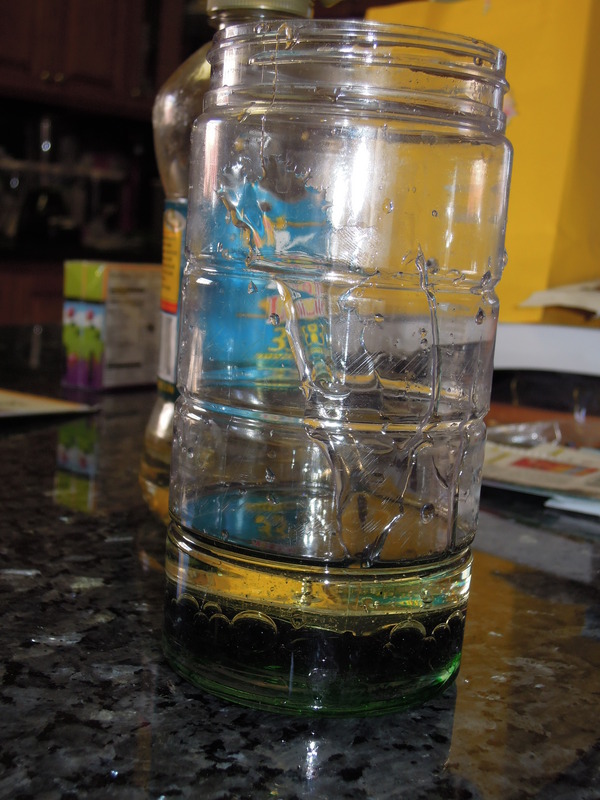 Finally we added some corn syrup to the bottle and watched that sink below the water and created three distinct layers. The green is the corn syrup, the black (it was supposed to be purple) is the water and the yellow is the oil. After that we just played around with the mixture like stirring it up and watching them separate again. 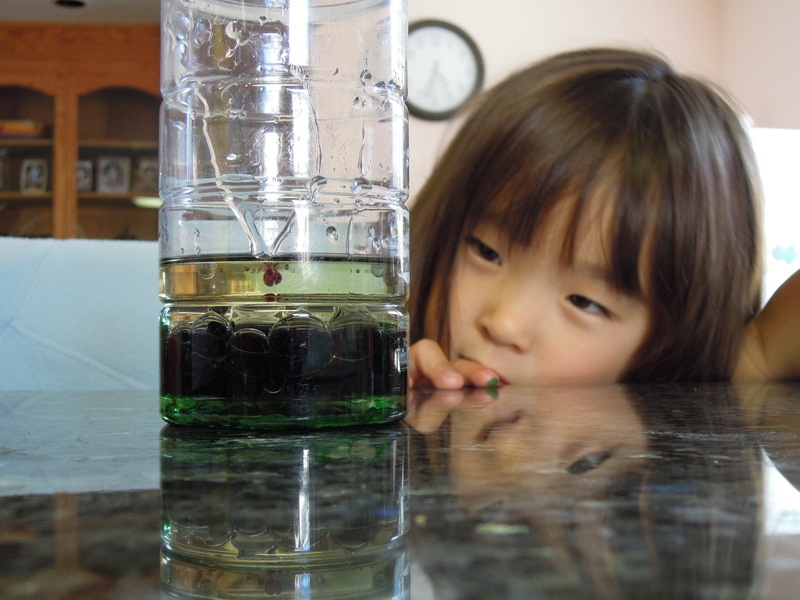 We also tried adding more food coloring and watched as it slowly sank through the oil into the water layer. Not long after this my 2 year old woke up and wanted to play as well. It didn’t take long for the concoction to be spilled and that was that for this experiment but we had a blast. Even when daddy came home he was watching the experiment and making suggestions on things to try out. I know I’ve been MIA for awhile but I was taking a killer class for my post-MLIS certificate that took up every waking hour. But I’m back and wanted to mention this really cute book. For anyone with more than one child this is a must read. 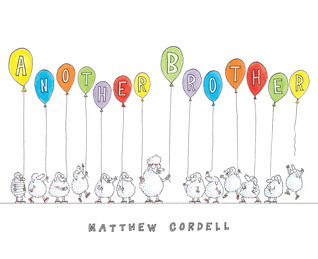 Life was good for Davy with doting parents who adored everything thing he did and then along came a bother…I mean brother…and then another…and then another…until he had 12 little brothers. They followed him everywhere and wanted to do everything he did and it drove him crazy. That is until one day they developed their own interests and no longer followed him. Suddenly Davy was feeling very lonely when along came a baby sister! And she followed Davy everywhere and wanted to do everything he did which made Davy very happy. This was an extremely cute book and I enjoyed reading it along with my daughter who is almost 5. She has a 2 year old brother and this was the perfect book for her as she’s now dealing with her brother wanting whatever she has or wants to do whatever she’s doing. I’ve found when she’s about to have a meltdown after fighting over chairs, books, etc. with her brother or angry because he keeps following her I just have to mention Davy. I tell her “aren’t you glad you have just one brother and not 12 like Davy? !” It never fails she laughs and says “Yes!”. She’s amazingly good with her younger brother and I’m glad we read this book to help her deal with her younger brother. 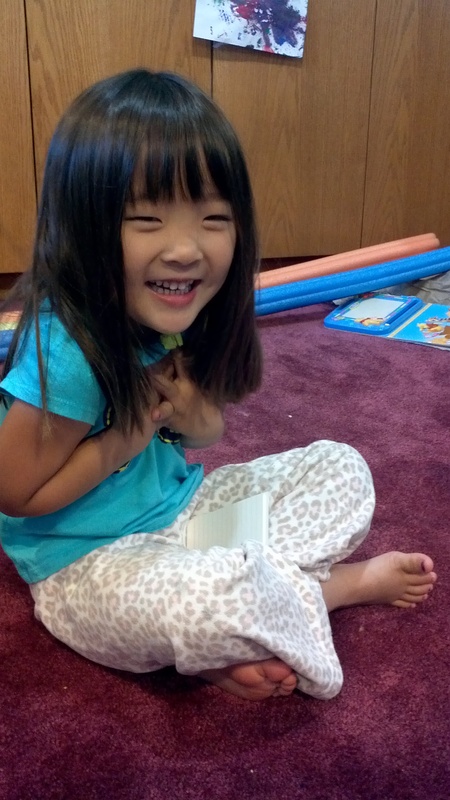 I’ve been working with my daughter on reading and recognizing sight words. She gets easily frustrated so I’ve been struggling to find ways to keep her interested in practicing. 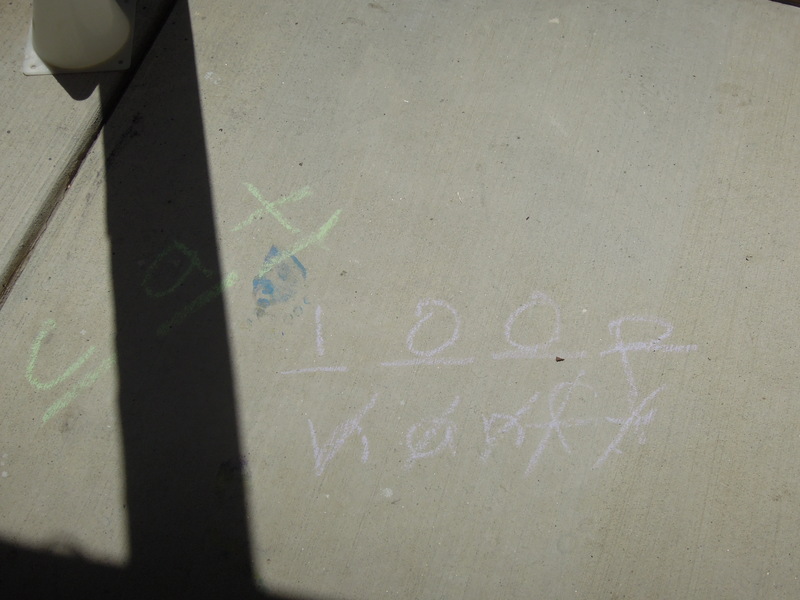 With the weather being so nice and the kids wanting to be outside all the time I decided to try a simple game based off of hangman. I started off with 3 and 4 letter words and she did great. I didn’t actually limit her guesses and just let her guess as many times as she needed and then she figured out the word I was thinking of. 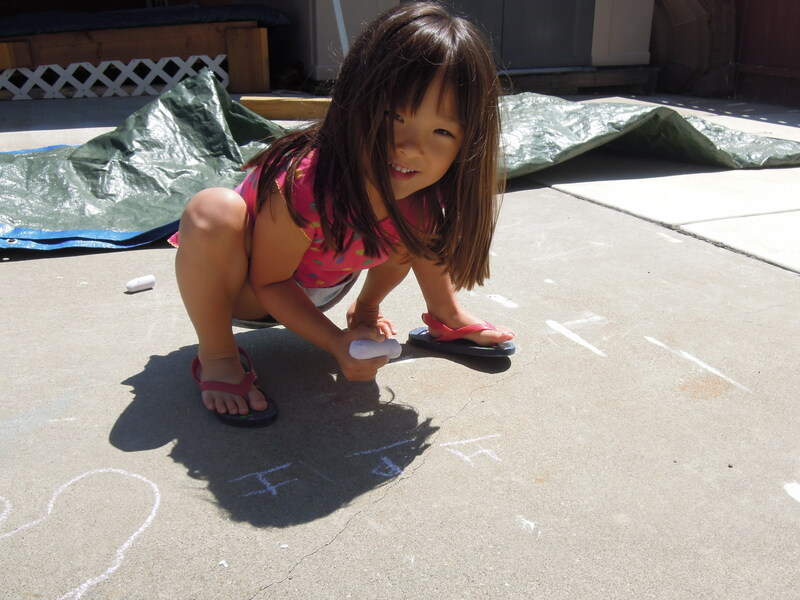 Then she decided she wanted to think of a word and let me guess. I was impressed that she was actually able to think of a word, figure out how many letters were in it and then fill them in as I guessed. Since she was enjoying the activity so much we also worked out some of the combination sounds we have been working on in our reading. 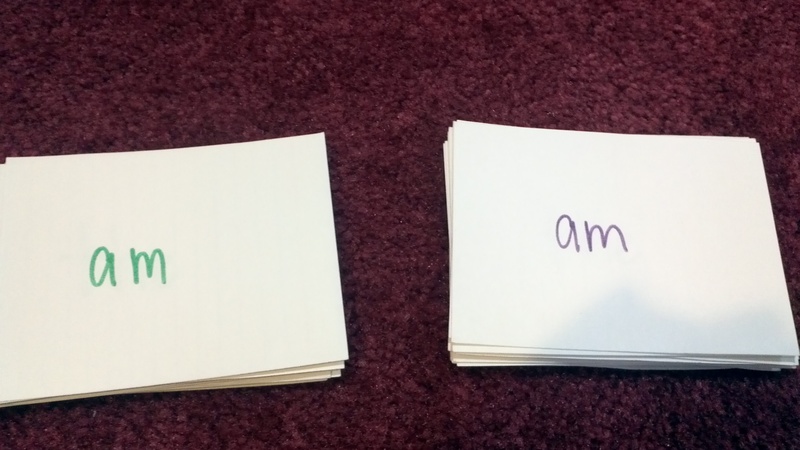 I would love to hear any other suggestions for making learning to recognize words fun. This is a great book for introducing shapes in a fun way. It takes each shape and transforms it into some fun picture in the sea from dolphins to starfish and many more. My two year old liked flipping through it and naming all the shapes and trying to name all the creatures that were in the book. 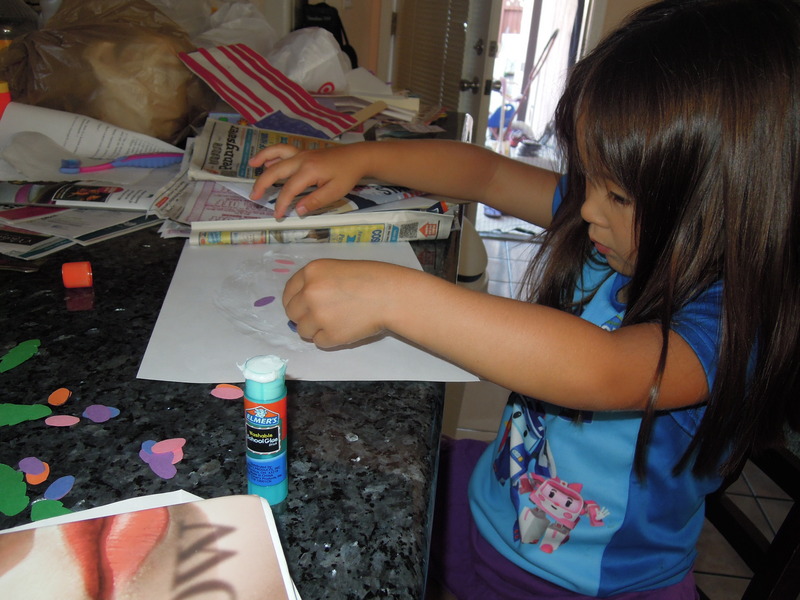 While my two and four year olds were flipping through the pictures again I grabbed a few pieces of construction paper (which I snagged at a back to school sale since we tend to go through them quickly) and started cutting out several of each shape. Luckily we have this shape sorter so I used each of the blocks to trace each shape since I have no artistic talent whatsoever. It was a little late to start an art project so I saved them for the next day. I somehow missed taking a picture of the final outcome but she used the “leaf” shapes to make the fish’s tail. 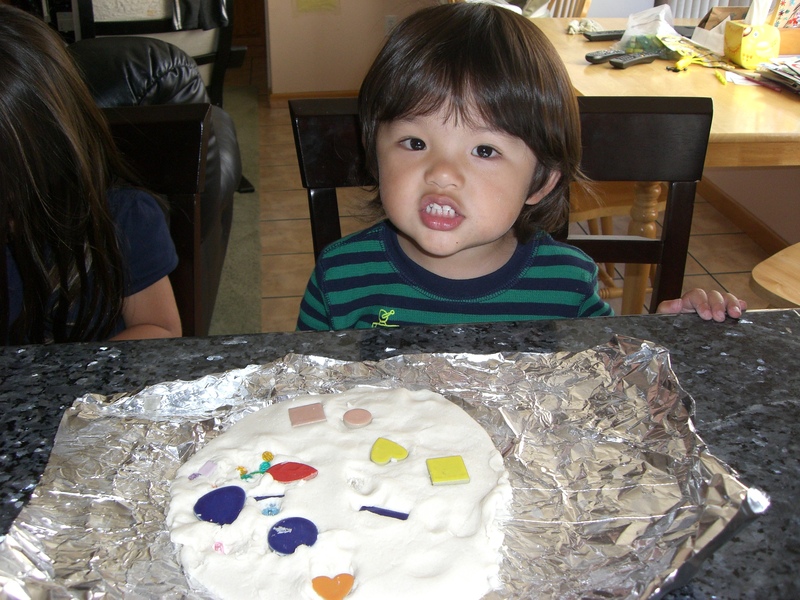 Then later we used more of the shapes and some paint to make our own ocean. 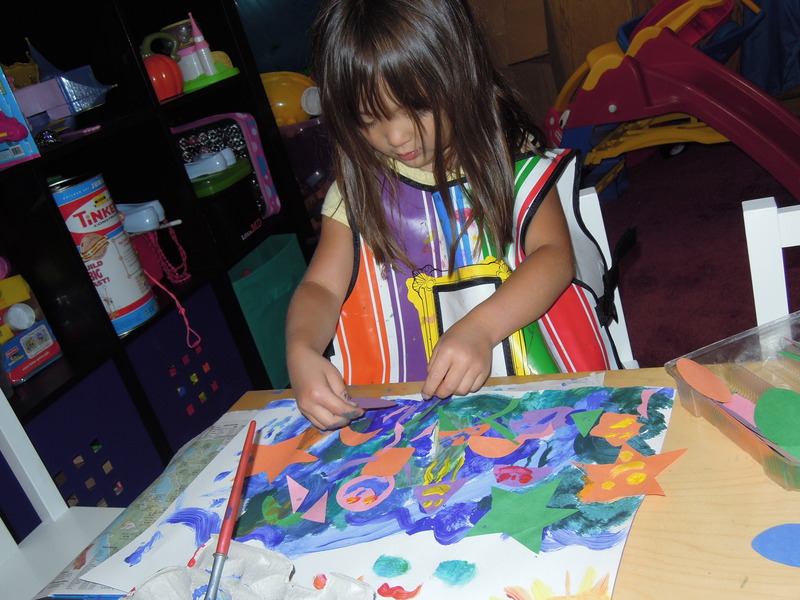 I loved watching what she would come up with to create using the shapes and she painted waves, waterfalls and caves. 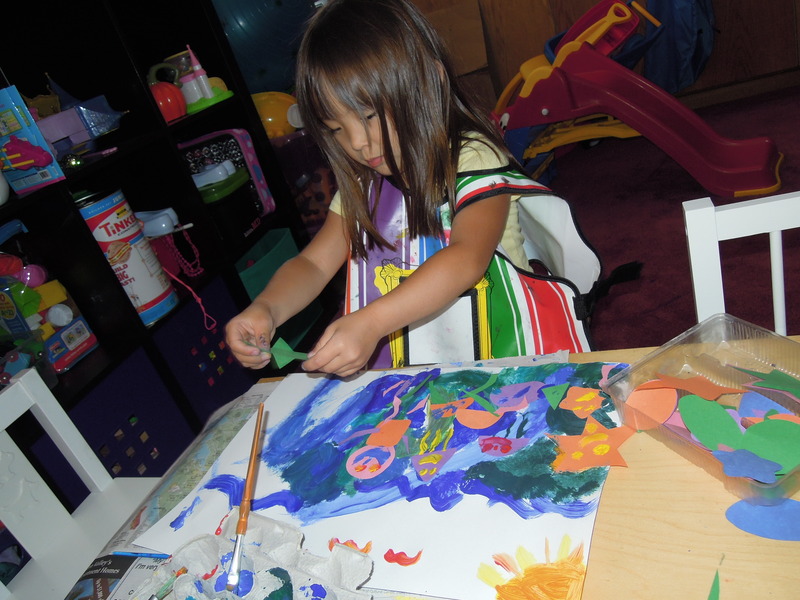 The other fun thing was blending paints together and working on what colors do you have to mix to make new colors. We used a lot of blues, greens and white to make the ocean and then some yellow and orange for other items. 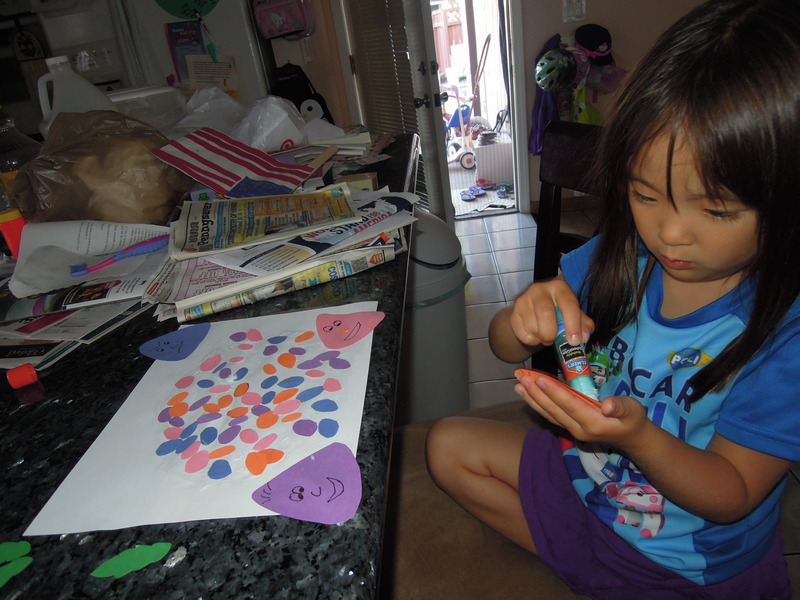 She amazed me how many of the color blends she’s remembered. 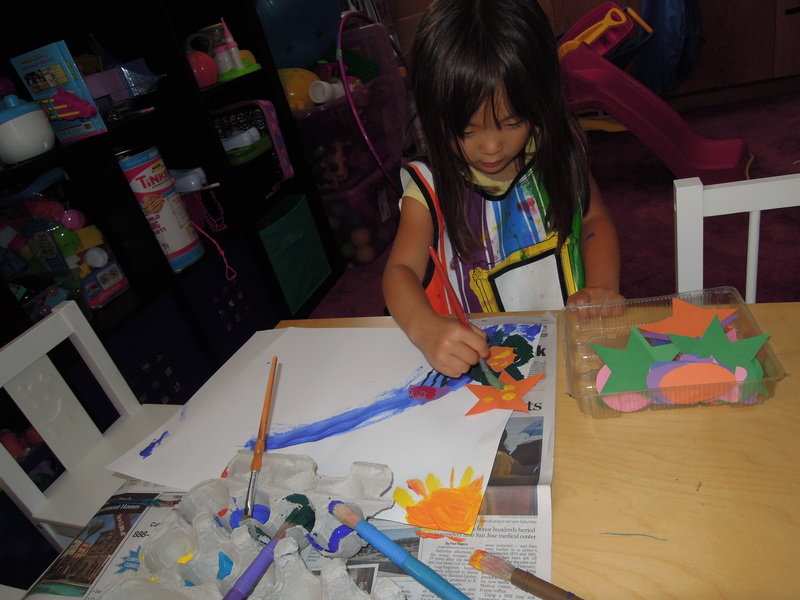 My daughter had a blast creating fish, divers, water falls, etc. Sea Shapes is definitely a great book to brainstorm about such ideas. I was down in Anaheim attending the annual librarians association conference last week and one of the publishers had this book for sale. Our family are huge Elephant and Piggie fans so I knew I had to get it. If you have not started this series you really must! My four year old (almost 5!) goes crazy over it and my 2 yr old also loves reading these books. 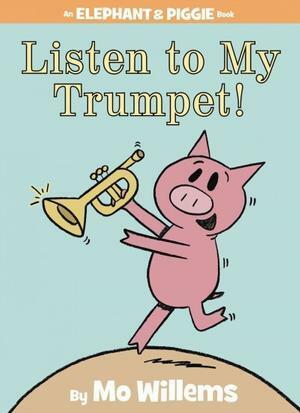 In this book Piggie is excited that she’s got a new trumpet and wants to play it for Gerald. Unfortunately the sounds coming out of the trumpet definitely aren’t music. The kids were bursting out laughing as we read each page of “br-ip! fr-ip! gr-ark!” and so on as Gerald is knocked off his chair with each new note. In the end with Piggie excitedly waiting to hear what Gerald thinks, Gerald must come up with a way to tell Piggie that it just wasn’t musical. In the end Piggie explains that she wasn’t trying to make music, she was trying to speak elephant! The story ends with Gerald helping Piggie perfect her “accent” and the kids immediately wanted me to read it again. Be forewarned there is no real dignified way to read this book. LOL. You might feel a little silly but that’s part of what made me laugh as well. Even funnier is when you have visitors who don’t have kids and they get drafted into reading it and watching their expression as they make their way through all of the noises. This is a great book and would top my list of the Elephant and Gerald books along with Can I Play Too? and Pigs Make Me Sneeze! Wonderful, high quality children's books. Also learn how you can earn free books.